Video: Mountain biking, kayaking, and nature watching at the Lafayette Heritage Trail Park in Tallahassee, Florida. As you can see in the video, a sunrise is always worth getting up for. All the better if a sunrise that beautiful is a mere fifteen minutes from my house. Moments before the sun peaked over the tree line to gaze at its reflection in Piney Z. Lake, we heard a ruckus of birds as they flew overhead. We came to the Lafayette Heritage Trail Park for kayaking, mountain biking, and an airboat ride, but the reason you schedule a shoot at that time is for lighting and wildlife. Florida Fish and Wildlife biologist Michael Hill told us that they’re getting the park onto the Great Florida Birding and Wildlife Trail. My favorite critter of the day was the juvenile green heron you see at 0:32, but it was also fun to see anhinga, gators, and the occasional osprey. The park also has gallinules, wood ducks (you can see a couple of wood duck boxes in the video), and over three hundred wood stork nests (located on Lower Lake Lafayette). The Lower Lake Lafayette portion of the paddling trail is currently clogged with tussocks. When the water gets low, dead plant material accumulates and traps seeds. The seeds grow in these mats, which become floating islands when the water gets higher. The dead vegetation you see in this photo is a result of herbicides, the first step in clearing the trail. My wife and I have been hiking the multi-use trails in the park pretty much since it opened a few short years ago. We usually start in Tom Brown Park, make our way along Upper Lake Lafayette and then to Piney Z. Lake. If we have the time, we head along the dam separating Piney Z. and Lower Lake Lafayette, and across the train tracks into the J.R. Alford Greenway (where a raised bridge is currently under construction to allow for safer passage over the rails). Walking all that way, you get to wondering about the dams separating the lakes and the “fishing fingers” on Piney Z. Those are remnants of the Piney Z. Plantation, which added the earthen dams and dykes in the 1940’s. The fingers are an interesting feature, letting you walk towards the center of the lake and offering some nice views of the dykes that the City of Tallahassee turned into small islands when they made the park. All of that damming has altered the hydrology of what was once a singular Lake Lafayette. This is why the paddling trail on Lower Laffayette has been closed for the last year, as our recent drought lowered the lake and caused it to become choked with vegetation. The trail will soon be cleared and will open by Thanksgiving 2013. Thanks to Michael and his airboat (and to Liz Sparks for setting us up with him), we were able to get a unique look at the lake and its floating islands of vegetation, called tussocks. The dams prevent the lake’s normal drainage cycles, and so the trails require some extra maintenance. Lake Lafayette is one of Tallahassee’s four sinkhole lakes, along with Iamonia, Jackson, and Miccosukee. All of them had historically emptied at different intervals, and all were dammed to prevent that draining for fear that it was harming the wildlife in them. We now better understand that these lakes’ ecosystems evolved with these cycles, and the other lakes have had their dams removed. 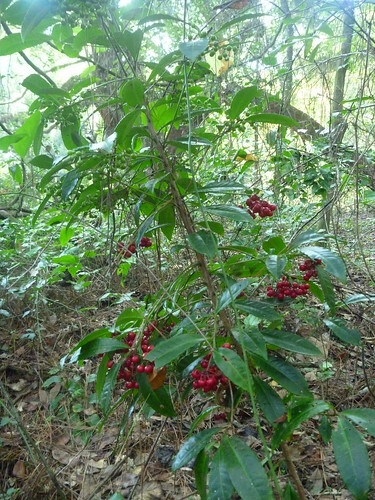 Ardisia crenata, an invasive plant found in the Lafayette Heritage Trail Park. On land, the multi-use trails need maintenance as well, and there is one thing that any of us who use the park can help with. Chuck Goodheart, who manages the park, is looking for help with invasive plant species, in particular, Ardisia crenata. This plant threatens to overtake native plants within the park. The city had spent thousands of dollars to try and eradicate it, only to have it return. Now they’re turning to people who use the trail. People have learned to carry bags when they walk their dogs; we can likewise bag and remove the plants and their berries when we see them in the park. In fact, there are bags for dog waste near the Piney Z. parking area. If people buy into it, it should be a cost effective approach. I want to thank Chuck for riding his bike on camera after recently having surgery on his foot. And I want to thank Georgia Ackerman for once again lending me a kayak. Todd Engstrom and I both got to try out the kayaks we’re taking on RiverTrek 2013, which is- oh my! – two weeks away. Todd, Georgia, and Liz are a great group to paddle with. 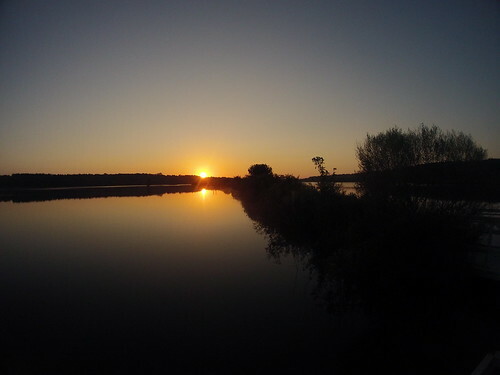 RiverTrek gets me thinking about the connection between the Apalachicola River and Bay, and the bay’s ever important estuarine ecosystems. This dynamic is at play on Lower Lake Lafayette, which flows into the St. Marks River, which itself flows into the St. Marks Refuge with its vast marshes. 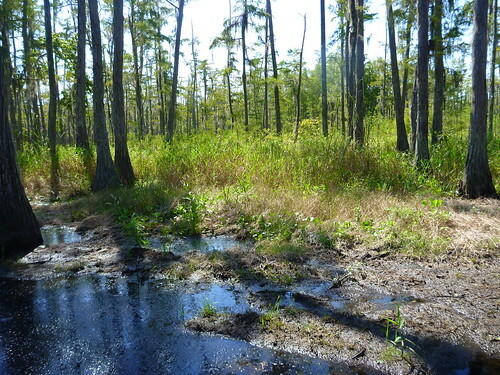 Upper Lafayette has a sinkhole that drains into the Floridan aquifer, the source of water for most of north Florida and parts of South Georgia. The aquifer also feeds springs that feed rivers that ultimately feed the Gulf. Nature has this “six degrees of Kevin Bacon” thing going on, especially when it comes to the way water moves. That includes rain and everything it carries with it from the roadways and lawns in the developed areas around Lake Lafayette. (Watch as David Kimbro explains the natural- and unnatural- nitrogen cycle, and how oysters can help). In all the years I’ve been coming here, I had no idea about this, or the why the dams were there or what their effect on the lake is. I’m glad I had this “closer to home” EcoAdventure to get to know a familiar place a little better. For more information on the Lafayette Heritage Trail Park, visit their web site. You can watch a video I produced on greenways and trails in Tallahassee by visiting the new and improved Dimensions web site. Music in the video by pitx and airtone.